Holy Week in the Philippines | Walk with us! Fr. 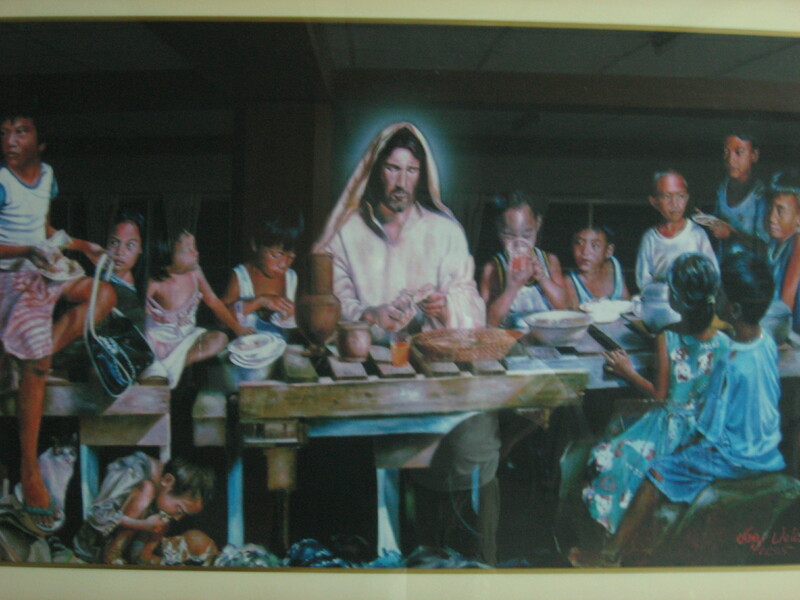 Johnny writes: "This is painting done by Joey Velasco, of slum children. Notice on your right the child sitting on a garbage can and the lad to the side. Joe Velasco is a Filipino artist who lives close to our house. “Just a little news… I arrived in Manila on Wednesday at 11:30 p.m. Fr. Vincent Sri Herinati, superior of the community, was there to welcome me. It was a very long journey. I finally got to bed at 2:00 a.m., Holy Thursday. I left Chicago on Tuesday at 3:30 p.m! I could only sleep about three hours due to jet lag and it being so hot . I was happy to have a fan in my room as the temp was 83 degrees. “I went to the ‘Church of the Revolution’ for the Holy Thursday liturgy. It is so called because after the peaceful change of government the new president, Corazon Aquino, had it built in Thanksgiving. I went with Fr. Al Back, Formation Director and Fra. Jonathan Schneriders from Brazil who is studying the native language, Tagalog. It was a beautiful Mass, lovely singing and procession. We stood for 2 1/2 hours not knowing that you had to be there at least 45 minutes before it began to get a seat. I was grateful that the church was air conditioned. The temperature during the day is in the 90s and humid I am usually sweating here! 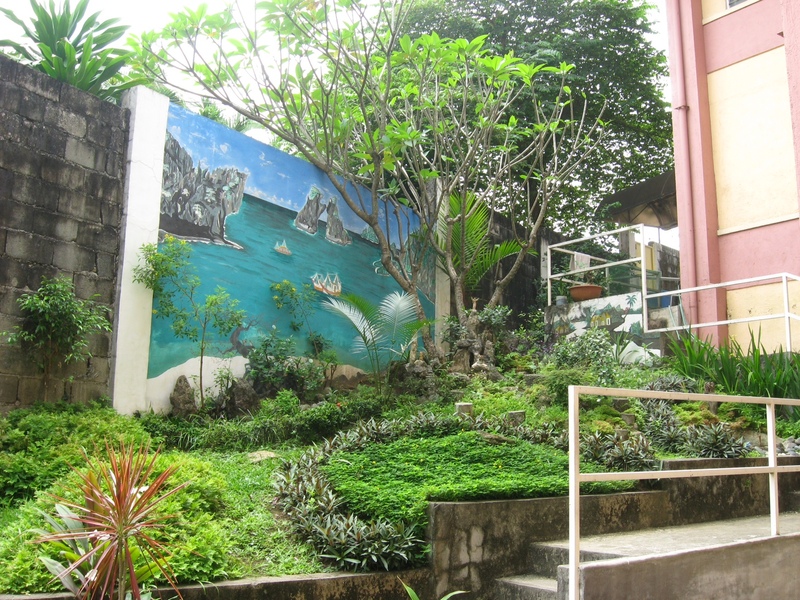 "This garden on our grounds of the community house was done by an SCJ from Vietnam while he was a student," writes Fr. Johnny. "His name is Br. Thai D Tran and will soon be ordained a priest." “Good Friday services took place at one of our SCJ parishes which is located close to the large garbage dump in a very poor area. Many of the people scratch a living from it by looking for recycle material that they can sell. I read that 45% of the people of the Philippines live on $2.00 a day. I went with Fr. Vincent Sri, who is pastor of the parish, and a visiting Holy Cross brother. I sat on a bench in the very small church. It was simply celebrated with a children’s choir. The entire service was said and sung in Tagalog. The people were so friendly and welcomed you with a blessing: taking your hand and putting it on their forehead with a bow. I in turn placed my hand of their head or shoulder. “Fr. Heiner Wilmer, the provincial of the German Province, arrived on Holy Saturday afternoon from Cagayan de Oro after visiting one of his priests. We are friends from my days in Rome. He had to get up at 3:00 a.m. Easter morning to catch a plane for Vietnam where he will give a retreat to our community. We celebrated Easter Mass with Fr. Al and then went out pizza. “Today, Easter Sunday morning, most of the community is out for Easter Sunday Mass. I look forward to our Easter meal. I am happy that I can enjoy the food. I especially like their coffee and fruit, and thank God I like rice! Fr. 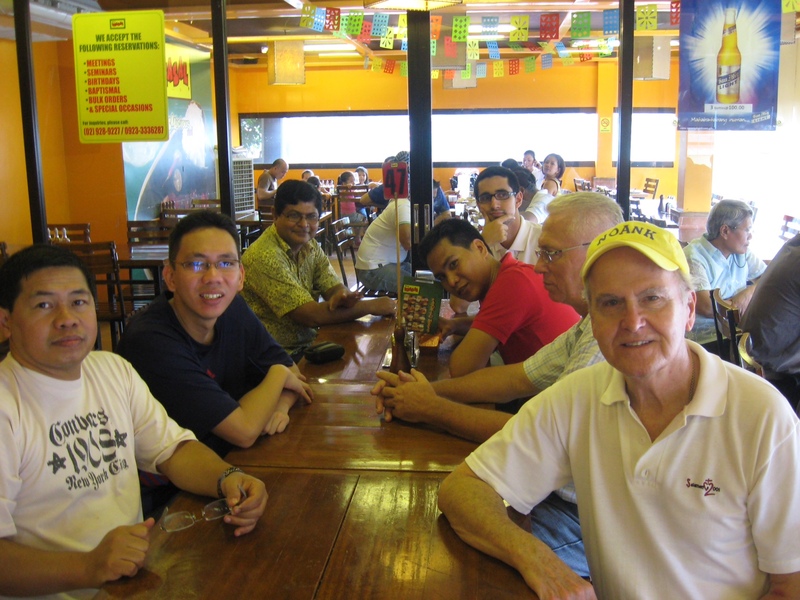 Johnny (front with yellow cap) with students and SCJs at a Philippine restaurant. I was at Sacred Hearts in Franklin when the first group was studying at SHST ESL program. I think Francis might be the only one who was part of that original group. Yes, David, we learned English at SHST ESL Program in 1988-89 and Fr. Francis was part of the original group. I am Fr. Juan Domingo Griffone, scj from Argentina and now in Rome. Great to read how well you are doing and what is going on. I will keep checking the scj blog. You look great. I would never know it was you if you hadn’t worn that yellow hat. Fr. Juan Domingo Griffone, S.C.J. from Argentina. I remember you well. What are you doing in Rome? David, I came to Rome on December 2011 for the updating course for treasurers. I went to the Philippines last March for the erection of the new Region and we had a nice time together with Fr. Tom Cassidy. It was very nice for me to be there, I enjoyed my 12 years as missionary in Mindanao and I had the opportunity to met again Fr. Francis and the rest for the event. Juan, Thank you for the information. I’ve gone a different path after 50 years as an SCJ. Uncle Johnny, It’s so wonderful to see you and “hear” your voice through your beautiful writing. Good luck with teaching- those students are very lucky to have you and as always, you’ll learn so much from them as well. Thanks so much for the posts, I’m so happy to hear that you are doing well and love where you are. You are very lucky to be there with all those beautiful people and they are very lucky to have you. We look forward to more news, and we miss talking with you! Keep well, sending lots of love!